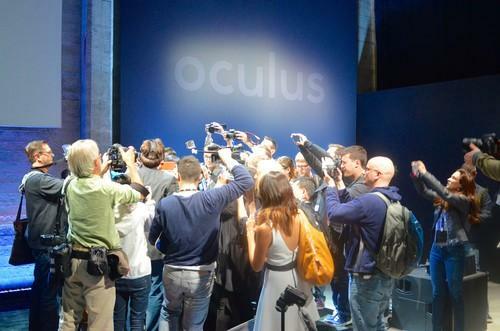 Attendees at the Oculus press event on June 11, 2015, huddle around Oculus VR founder Palmer Luckey to get a look at the Rift headset. Still, no firm launch date was announced, nor was a price. The company has previously estimated that the total price of Rift would be in the US$1,500 range, factoring in a Rift-compatible computer, which the company does not sell.